Are the DVLA gearing up for legal action against ParkingEye? ParkingEye have been operating at Southampton Town Quay since April 2012, and by July 2014 had issued 18,627 tickets. At £100-£110 a pop, this will have netted ParkingEye a cool £1.8 million if all were paid. However, since October 2012 they have also been alleging that keeper liability applied at that site. This is of course untrue. The Protection of Freedoms Act 2012, schedule 4 describes that keeper liability only applies on relevant land, and that land where byelaws cover parking is not covered by the Act. Southampton Town Quay is a port and has byelaws which cover parking, and therefore keeper liability does not apply - only the driver is liable to parking charges. Despite this, and despite being warned several times by members of the public, ParkingEye continued to issues tickets stating keeper liability applies. Amazingly the DVLA only became aware of this on the 5th August 2014 as this FoI request shows. This was one day before The Prankster blogged about the situation. The FoI request also shows that other information was requested, but is withheld by the DVLA in case anybody has broken the law. The documentation you requested is held. However, DVLA considers it exempt from disclosure under section 31(1)(g) of the FOIA and in particular section 31(2)(a). DVLA believes that disclosure of the information requested would be likely to prejudice DVLA’s ability to exercise its function for the purpose of ascertaining whether any person has failed to comply with the law. The Prankster therefore wonders who the DVLA beleive might have broken the law. The obvious suspect is ParkingEye. By claiming that they can sue the registered keeper under PoFA when they can't there may be a tort of deceit going on. Once the DVLA have finished looking at ParkingEye, they may also want to check out VCS and APCOA for claiming keeper liability at various airports, and AS Parking for claiming keeper liability on a council car park in Cornwall. Picture of the week. CEL screw up POPLA appeal. 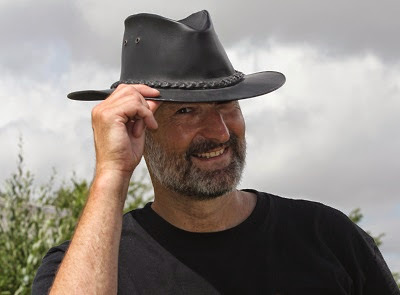 A post on pepipoo describes how Civil Enforcement Limited are trying to pull the wool over POPLA's eyes with a series of misleading and contradictory statements. They tried to pretend the Data Protection Act does not allow them to produce a copy of the contract. This is clearly nonsense. They tried to pretend the Parking Charge of £70 is a core contractual term. If it was a core term, it would be given equal prominence to the actual core contractual terms, shown here on the signage. The Prankster cannot see that there is a charge of £75 anywhere on this sign. Perhaps it is in the small print - but if so then it is not a core term. Despite this, CEL seem to have a disconnect with reality, asserting that the charge is mentioned in large bold font. Although CEL argue the amount is a contractual charge, the NtK states the charge is for breach of contract - payment not made in accordance with signage. The signage small print, happily for us decoded by the motorist in his appeal, also confirms the charge is for breaching conditions. It also confirms it is a deterrent, and not therefore based on a pre-estimate of loss calculation. Later on, they say it is a pre-estimate of loss after all. They list various random categories, 'some of' which make up the charge, in the hope the assessor will magically guess which ones they are. Which leads us on to the picture of the week. The Prankster freely admits the only reason for this entire blog is the naked woman spread-eagled over the bonnet of the car. 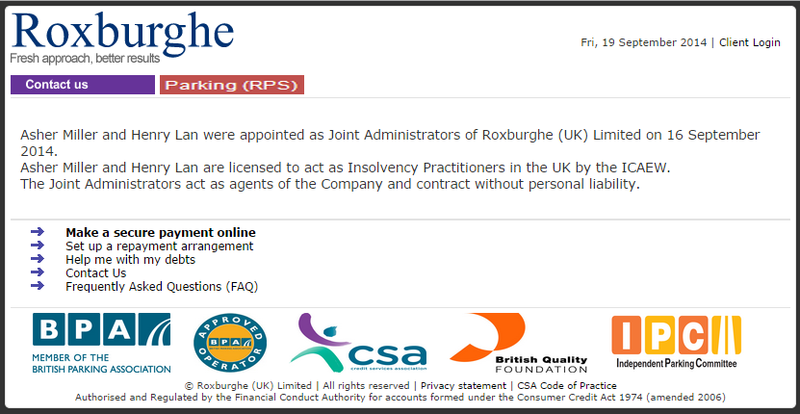 Roxburghe have gone into administration on 16 September 2014. According to one of their staff, almost everyone was made redundant with no pay, leaving only a skeleton crew. Roxburghe act as debt collectors for the parking industry. In the most usual way of operating, a parking company will appoint a debt collector to chase a parking charge. The debt collector then sends scary letters, adding their own fee on top on the parking charge. 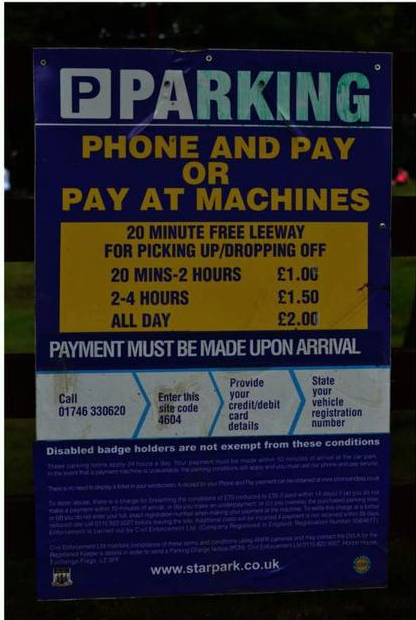 If the motorist pays up, then they keep this fee and pass the rest of the money back to the parking company. As debt collectors, unlike bailiffs, have no legal powers, many people ignore them. Roxburghe have previously had troubles, being banned from DVLA access for three months. In February, the OFT revoked their consumer credit licence, branding them 'unfit'. Roxburghe appealed this decision, which is still being reconsidered. Alastair Turnbull, a solicitor who acted for Roxburghe and other firms has also been stripped of the consumer credit licence. Gary Osner, the director of Roxburghe appears to already have a phoenix company ready, ZZPS. Gary Osner was made a director of the British Parking Association Ltd in July 2014. It is not known how the BPA Ltd will react to the news that as well as his company previously being unfit and barred from DVLA access, he can now add insolvency to the impressive list of credentials. Possibly they will make him joint CEO with Patrick Troy. A thread on moneysavingexpert describes a the Hole in One pub car park in Lytham where the pub manager was apparently colluding with CPM UK to trap motorists. Apparently the pub was not making enough money from normal pub activities so the manager looked to scam motorists for parking charges to top up income. The motorist explained how the sign was not only covered by bushes, but was also turned around to face the other way. The sign explained cars needed a permit, but did not explain how to get one. The motorist visited the pub, but at no time was told he needed a permit. Two car park attendants hid in a van to trap motorists, making no attempt to mitigate losses by warning motorists. The motorist duly appealed, which was turned down. He then appealed to POPLA where the appeal was upheld because CPM UK offered no evidence. The motorist visited the pub again where he noticed the signs were gone. On enquiring inside, he was told about the nefarious activities of the former manager. The Prankster previously reported that Stephen Duff of Proserve may have broken the law by conduction litigation (700 times). A letter has been sent from our Chief of Corporate Affairs to Paul Philip, the SRA’s Chief Executive, asking that he ensure this matter is investigated, and prosecuted if the evidence is sufficient. Perhaps the Law Society was mindful of the provisions of the s22 of the Solicitors Act 1974 which provides for it to be an offence for anyone to a prepare a document for legal proceedings for payment. A Court Claim form perhaps. Or s20 which states that no unqualified person, acting as a solicitor, may commence any action in his own name. 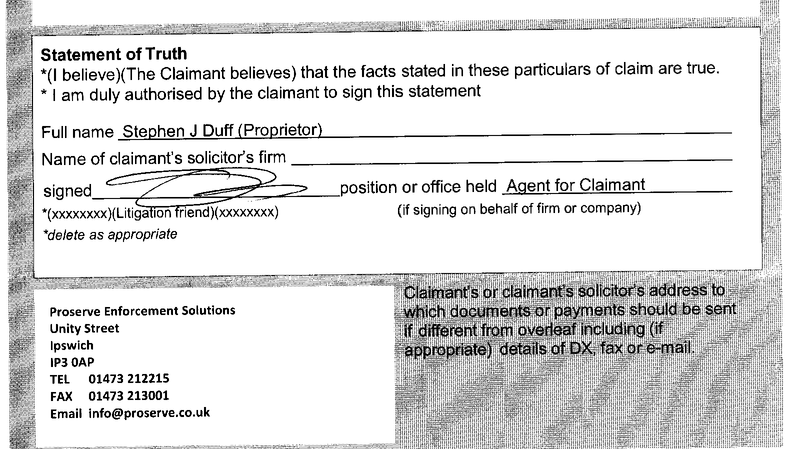 As we know Mr Duff has signed Statements of Truth in his name and competed the box on the claim form for the Solicitor in the name of his firm. ICA = "Independent Complaints Assessor" - as opposed to ICO (Information Commissioner's Office) who deal with matters of data protection and Freedom of Information issueS. A motorist has been unable to get a yes no question answered by the DVLA. The question was not especially difficult. Is compliance with the BPA Ltd CoP a necessary requirement for the DVLA in determining reasonable cause? 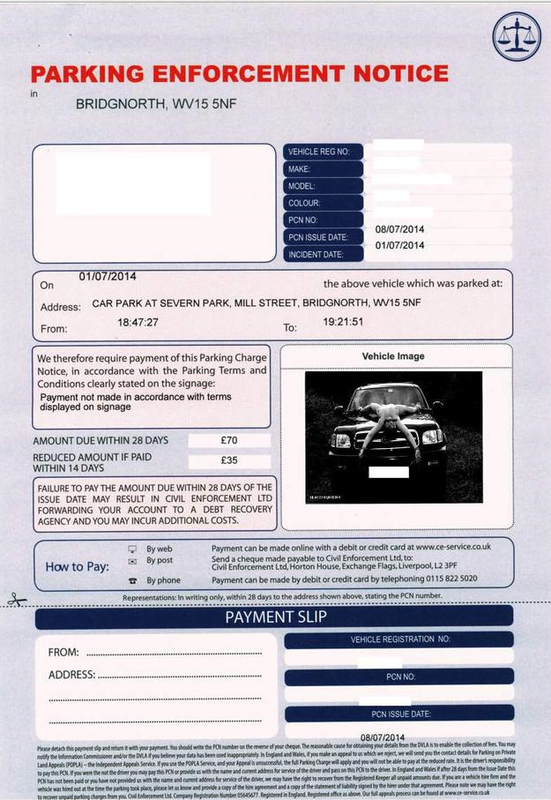 The story begins when the motorist was issued a windscreen ticket by Local Parking Security (LPS) Ltd who at the time were in breach of the British Parking Association Ltd Code of Practice (CoP). Although there were several breaches, the main one was that the charge was only decreased by 33% for early payment, not 40% as required by the CoP. The motorist therefore brought this to the attention of the DVLA who stated that details are only given out to organisations who adhere to the code of practice. The motorist asked the DVLA not to give out his details to LPS Ltd because as they were in breach of the CoP there was no reasonable cause to access his data. The DVLA gave out his data anyway, and replied on 12 November, reiterating that reasonable cause does not relate to full BPA Code compliance. The motorist replied on 13 November. “I take serious issue with your statement, "As previously mentioned, reasonable cause does not depend on full compliance with the code of practice"
"....vehicle keeper information is disclosed only to companies that are members of an Accredited Trade Association (ATA) and adhere to its code of practice"
The motorist then chased the DVLA for replies up to 28 February when they finally replied. Information from the vehicle record is released under reasonable cause provisions where the reason for the request relates to the vehicle or its use, following incidents where there may be liability on the part of the driver. The Agency would not be able to justify withholding personal information from third parties able to demonstrate reasonable cause without evidence that such disclosure would cause unwarranted and substantial distress or damage. Full compliance with the Code of Practice either applies to reasonable cause or it doesn't; which is it, I don't want any stock DVLA 'lines’ trying to fudge the answer, I am entitled to a ‘yes’ or ‘no’ straight answer from the DVLA to a straight question. “The issue that I require you to address is that of the effect of non-compliance with the BPA Ltd CoP on 'reasonable cause'. You will note that both David Dunford and Liz Symons have sought to duck and dive the issue. In her latest response, for example, Liz Symons has deliberately changed the meaning of my enquiry from (in essence); is compliance with the CoP an essential ingredient of 'reasonable cause' to does compliance with the CoP equal 'reasonable cause' and to which she has then answered in the negative. What Liz Symons has done is deliberately manipulated and misrepresented my enquiry in order to avoid answering it. I know full well that compliance with the BPA Ltd CoP does not equal 'reasonable cause' because there are also other factors taken into account. That wasn't my question. My reasonable enquiry therefore still stands. Is compliance with the BPA Ltd CoP a necessary requirement for the DVLA in determining reasonable cause? Yes or No. Kevin Watts from the DVLA replied on 28 March. Kevin Watts lost his letter, but luckily the motorist was able to provide a copy to the ICA investigator. On 7 April the motorist asked for an answer to his question again. On 11 April Kevin Watts replied that the DVLA had nothing to add. On 13 April the motorist lodged a complaint and the ICA took over. The DVLA ran interference, failing to provide a number of crucial documents, and making the investigation harder. The short answer to your question is “No, compliance with the code is not a necessary requirement in determining reasonable cause”. He also found that only lip service is paid to the stated requirements. If a breach is found and reported to the DVLA they do nothing themselves. The most they will do is pass information to the BPA, who then also do nothing. In fairness to the DVLA, your report of alleged breaches by LPS did not itself amount to proven breaches: it was for the BPA to investigate, take any necessary action in relation to LPS’s accreditation and then inform the Agency of the outcome. In that circumstance LPS might fail to meet a key criterion to receive DVLA data; future applications by LPS, and access to the DVLA database, could then be refused or suspended. However, although the DVLA says it has tough expectations of the ATA, for some reason enforcement action was not taken by the BPA in the period in which LPS was given your data or, apparently, since. Turning to the essence of your complaint, I am not at all reassured that the DVLA gave you sufficient evidence of its concern that the BPA should fulfil its obligations. It states that its delegation to the ATA “promote[s] greater self regulation and further reinforce[s] protection of motorists’ privacy” but little or nothing seems to have happened after it referred your genuine compliance concerns to the BPA. In the absence of a clear statement from the BPA, based on a robust investigation, that LPS was in full Code compliance, my view is that LPS’s status as a data recipient remained open to question. On balance, I cannot see that the DVLA’s handling is congruent with its aim of instilling confidence in the disclosure process and ensuring fair treatment and clear standards. I contrast the BPA’s limp response referred to you by the DVLA (paragraph 14) with the DVLA rhetoric reproduced in paragraph 28. I do not think that the Agency’s handling here was consistent with the oversight of “tough safeguards” which is suggested in its literature. In the latter stages of the correspondence you pressed the DVLA for a yes/no answer to the straightforward question I dealt with in the previous section. For some reason, the Agency did not feel able to answer this question even though to do so would have required fewer words than the statement that it had answered the question already. That said, I think the underlying point in your case had little to do with reasonable cause - incontestable in your case – and everything to do with the basis of the Agency’s assurance that LPS was code compliant and suitable to provide data to. Unfortunately the Agency’s handling of your correspondence stalled before and after you had requested ICA review. The Agency was then unable to provide me with key documents. This necessitated further communications with you (see paragraph 21). Taking all of the above into account, I have no doubt that the DVLA mishandled the correspondence with you and me. I remind it of the Ombudsman Principle “Public bodies should create and maintain reliable and usable records … [and] should manage records … to ensure that they can be retrieved and that they are kept for as long as there is a … business need”. I uphold this part of your complaint. I recommend that the CEO of the DVLA apologises to you for the lapses I have identified and offers you a payment of £75 in recognition of the Agency’s poor administration which, as well as stalling at the local stage, occasioned a delay of at least three months in my review and further time and effort on your part in preparing a document set for me. Essentially were are therefore left in the same position as before. The DVLA trumpets far and wide that it only discloses data where there is reasonable cause, but the nitty gritty is rather different. There is very little actual effort made to ensure this, and the audits the DVLA boasts about are little more than rubber stamping exercises. The vase number of complaints uncoverable via an internet search show that the industry goes unregulated; there is no pro-active effort made to uncover dodgy practices and when these are uncovered, no timely effort is made to sort these out or punish transgressors. The ICA has concluded that the DVLA has obligations to investigate but that it has delegated that to the BPA. The ICA finally confirms that the DVLA’s usual response and business standard is in direct conflict with what they claim it to be. The ICA confirms that the DVLA have a policy of being useless and thus when they are useless they are policy compliant. This quote should be included in all complaints to the DVLA; "Concluding, the issue of real concern to me here is the lack of evidence of vigilance in the DVLA’s dealings with the BPA “ This lack of vigilance can then becomes evidence as a norm in the DVLA to build up the picture to the ICA/Ombudsman. Has Stephen Duff of Proserve broken the law by conducting litigation? It has come to the Prankster’s notice that a formal complaint has been lodged with the Solicitor’s Regulation Authority (SRA) against Proserve Enforcement Solutions/Stephen J Duff. It is alleged that Proserve/Mr Duff may have been conducting litigation contrary to the provisions of the Legal Services Act 2007. It is a criminal offence to conduct litigation when not entitled to do so under that act. On summary conviction the penalty is imprisonment for up to six months and a fine of up to £5000. On indictment the term is up to 2 years and an unlimited fine. As Proserve is known to have issued 700+ claims at the Ipswich Europark alone, the legal profession may well take a dim view of his activities. Note that it says that the Claimant or their Solicitor’s address should be inserted. Mr Duff is neither. Then there is another problem in that is alleged that Mr Duff is not entitled to sign the statement of truth on behalf of a third party. CPR 22 para 3.11 gives examples of who can and cannot sign..
Mr Duff often expresses his signature to have been placed there as "Litigation Friend" but you can only do that if the claimant is a child or a protected person e.g person in hospital or a person who by reason of mental disorder is incapable of managing and administering his own affairs. It may be of course, that Mr Nigel Robson of Ransomes Europark is mentally incapable and therefore Mr Duff has perfect right to do this. However, Mr Robson may have other views. Where the statement of truth has been improperly signed it provides grounds for having the case struck out. Improperly signing a statement of truth is a contempt of court. If you have received a claim from Mr Duff, and the foot of page 2 is like the example above, then you may wish to ask Mr Duff on what basis he is conducting litigation and signing the statement of truth. Please see the attached claim form which, has been filed by Proserve Enforcement Solutions and its proprietor, Mr Duff, has signed the statement of truth. Proserve is an agent of the landowner and as such I believe that he is not entitled to sign a statement of truth. Where he has issued proceedings I believe that his conduct is caught by the Legal Services Act as it falls to be the conduct of litigation and which I do not believe he is legally allowed to undertake. Proserve, (nor Mr Duff), does not appear to be a member of any of the regulatory bodies established under the Act. Mr Duff is now issuing revised claim forms signed by someone (apparently) entitled to do so. I would request that you consider taking action against Proserve/Mr Duff, under your common law powers of prosecution, if the SRA is satisfied that he has conducted litigation contrary to the provisions of the Legal Services Act. Nice try but when it comes to any hearing remember to mention to the court that Mr Duff issued proceedings and signed the statement of truth when it does not appear that he was entitled to do so under the Legal Services Act and as such the claimant should not be permitted to profit from that conduct. Then sit back and let the Judge ask some rather awkward questions. Debt Collectors are not authorised to carry on litigation which as explained above is a "reserved activity." So the debt collection company will have to instruct a person who has the right to conduct litigation which will usually be a Solicitor. What undoubtedly happens is that the debt collection companies prepare court papers for clients but get the client to sign the Statement of Truth. On the claim form the debt collection company will probably put their address. Sometimes, the debt Collection Company will sign the Claim Form as "Litigation Friend". They are wrong on both counts. If Mr Duff is acting illegally then he may want to ask the court to take 700+ other offences into consideration. As you can, or perhaps cannot, see, the signage blends nicely in with the foliage and is well camouflaged. Although the pole with the ANPR camera stands out, the sign is not easily seen. Perhaps the reason is the choice of colours - white on green, rather than ParkingEye's usual black on yellow. The clue to this strange collection of stealth signage is probably in the planning application, available here. The reference numbers are C13/0186/39/LL and C13/0187/39/HY. 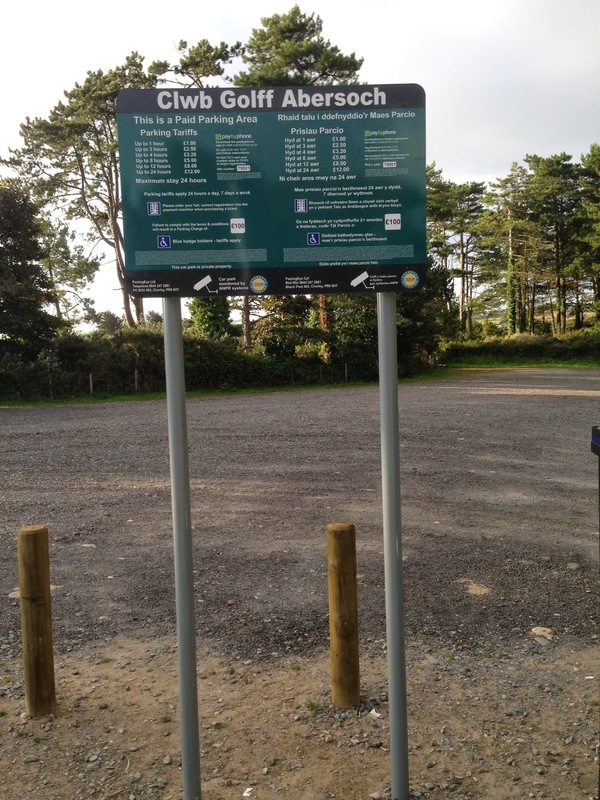 The car park has 161 spaces and the initial plan was for 14 signs with a white background. 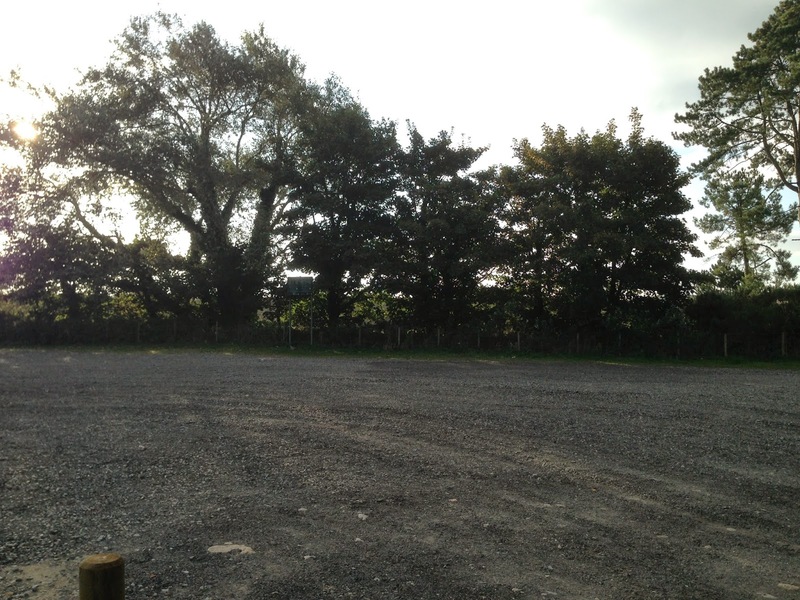 The car park is in an area of outstanding natural beauty, and a vast number of objections were received. As a result the planning permission was changed to 7 signs on a green background. This is obviously against the BPA code of practice which requires signage to be ample and visible. This new design meets neither of those requirements and is not fit for purpose - ParkingEye should therefore have walked away. As the site is used by large number of holidaymakers The Prankster predicts this will be a profitable trap for ParkingEye, generating large numbers of tickets from new visitors who do not spot the signs. One visitor reported to The Prankster that he visited twice and walked up and down the car park 8 times before he realised it was an ANPR car park. Ironically for a bloodsucking operation, the planning application was filed by Christopher Lee on behalf of ParkingEye. An objector to London Council accounts discovered that the parking appeals service POPLA was being run unlawfully. London Council employee Nick Lester has therefore rushed through an emergency vote to legalise the service. Nick Lester is also a committee member of the British Parking Association. If the vote fails, the worse case scenario could be that all the parking companies have to leave the BPA and join the IPC to continue providing an appeals service. It can be said therefore that he has a vested interest. Previously he has also misinformed investigators who raised the very legal issues which sre now plauging the system. It can be said therefore, that he either did not know what he was talking about, or he was lying. Either way, he does not appear to the lay observer to be the right person to resolve this issue, both having a vested interest and not really knowing what he is talking about. The latest vote seems doomed to lead London COuncils deeper into the mire. It is not clear that the vote can be retrospective. The council are attempting to use the Localism Act but the case of Maydown Company v Basingstoke and Dean Borough Council establishes that the Localism Act cannot be used retrospectively and also that if a decision was taken under a specific enactment then it cannot be later claimed to be done for a different purpose. It may therefore be prudent for the various councils to investigate this further before trusting anything that comes out of Nick Lester's mouth. Should POPLA be run by London Councils? There has been an objection to the London Local Authority Accounts on the grounds that Local Authority money and resources are being used to fund a scheme for motorists country-wide. The British Parking Association Ltd is a private company which amongst other things manages the independent motorists appeals service, POPLA, which is available to all motorists in England and Wales. POPLA is currently being run by London Councils on a 3 year stint due to expire in October 2015. It appears that the right authorities were not put in place to allow London Authorities money and resources to fund POPLA and there is therefore an emergency meeting of London Councils this Thursday to vote on the matter. The Prankster does not live in London and is ambivalent on the matter. On the one hand he recognises the great pressure Henry Greenslade must have been under to resist pressure from parking companies to pass though obviously fake cost calculations. On the other there is a huge conflict of interest with Nick Lester being both a director of the BPA Ltd and also overseeing POPLA. This is important because Nick Lester has an unfortunate habit of being biased towards the parking operators when any complaints are raised about POPLA, and gives fatuous and dismissive replies when complaints are raised. If you live in London you should therefore give thought to whether you want your money to fund a service for motorists country-wide, and should communicate your wishes either to your council. Due to the short timescale, phone and email is reccomended. Three councils are not even a member of the BPA, so there is little reason for them to agree public money and resources being used to aid a private company they are not even associated with. In any case, it is not remotely possible that London Councils will be re-awarded the contract when it expires. Parking companies are not happy so many decisions are going in favour of the motorist and so will take their chances with another organisation who may be more likely to favour them. This report seeks the agreement of the TEC Executive to recommend to all councils that they each formally resolve to expressly delegate the exercise of section 1 of the Localism Act 2011 to the TEC joint committee for the sole purpose of providing an appeals service for parking on private land for the British Parking Association under contract, confirming for the avoidance of doubt that the existing arrangements are and have been delivered on that basis to-date, and that the TEC Governing Agreement be formally varied accordingly. The service has been provided on a cost recovery basis by London Councils since October 2012 and it is proposed that it should continue in this way until the end of the contract period in October 2015. An express delegation of the exercise of section 1 for this purpose by individual councils, and the variation of the TEC Governing Agreement to reflect this, would remove any legal doubt as to TEC’s authority to deliver the service and allow London Councils’ auditors, PWC, to conclude an outstanding issue in relation to an objection to the accounts. · Recommend to all 33 London local authorities that they: formally confirm that the functions delegated to TEC to enter into the arrangement with the British Parking Association were and continue to be delivered pursuant to section 1 of the Localism Act 2011; resolve to expressly delegate the exercise of section 1 of the 2011 Act to the TEC joint committee for the sole purpose of providing an appeals service for parking on private land for the British Parking Association under contract; and that the TEC Governing Agreement be varied to this end. On 15th March 2012 TEC agreed that London Councils should provide an appeals service for parking on private land for the British Parking Association under contract. This was on the basis that this would complement the service provided by PATAS which deals with appeals made against parking enforcement on the highway. It was considered at the time that providing the service on a cost-recovery basis would be in the public interest as: restrictions on parking within London on private land would have a direct impact upon London local authorities, their resources and residents; a significant proportion of the public affected and inclined to avail themselves of the POPLA service were likely to come from the Greater London area; and, having regard to those matters, as TEC was the only interested, qualified bidder. On 14th June 2012, TEC received a report to say that the basis for providing such a service had been accepted by the BPA and agreed that a contract should be entered into to provide the service. The service, known as POPLA (Parking on Private Land Appeals) started on the 1st October 2012 and has since provided the appeals service to more than 25,000 motorists. The service operates on a full cost recovery basis and at no cost to the London Council Tax payer. An objection was raised on the London Councils consolidated accounts by an interested person (residing within London) that TEC did not have the legal power to provide the service. London Councils’ auditors, PWC, have, for some time, been investigating this and numerous other objections submitted by the same individual. PWC has informed London Councils of legal advice it has had from the Audit Commission on the Commission’s view on the power of London Councils to provide the POPLA service. In essence, the Audit Commission advice accepts that the London local authorities have the power under Section 1 of the Localism Act 2011 to provide the service and that the exercise of these functions could be delegated to TEC. London Councils agrees with this conclusion. The Audit Commission advice, however, questions whether the exercise of those functions has been properly delegated to TEC. The issue turns on whether the Committee could be said: to have existing delegated authority under the terms of the TEC Governing Agreement; alternatively whether it made or confirmed such a delegation by virtue of the decisions it made to provide the service in 2012; or whether each individual authority should have expressly resolved to delegate the exercise of section 1 of the 2011 Act to the joint committee for the purposes of TEC’s delivery of the POPLA service with the TEC Agreement being formally varied accordingly. PWC has asked for London Councils’ view on this advice in advance of making a formal determination about the objection. London Councils and its legal advisors remain of the view that the service is currently being delivered by TEC on a lawful basis on behalf of all the participating authorities with their consent and proper authority under the existing terms of the TEC Governing Agreement, and confirmed by the Committee resolving to provide the service in 2012 with these matters having been raised with local authorities prior to those decisions being taken in the normal way in respect of TEC business. However, it is accepted, that there is room for argument as to whether individual councils had to state expressly that they agreed that the arrangement with the BPA was pursuant to exercise by TEC of their powers under section 1 of the 2011. Taking active and expedient steps to expressly clarify the authority of TEC to deliver the POPLA service is intended to satisfy London Councils’ auditors and inform their determination in respect of the objection raised by the interested member of the public on the consolidated accounts for the 2012/13 year. Further, this would help PWC to sign off the TEC and the consolidated accounts for 2013/14 by the statutory deadline. Have Civil Enforcement Limited made a bad DEAL? The Prankster has been helping several motorists who have been issued court papers by Civil Enforcement Limited for parking events on Co-op land. The claims follow a standard template and are all for £130. The interesting thing about this is that in each case Civil Enforcement Limited previously wrote to the defendant stating that of the £130 owed, £113.75 had been assigned to another company, DEAL Ltd, and that they would therefore 'no longer be involved in this part of the debt'. The remaining £16.25 is retained in case it 'may fall due to The co-operative'. However, according to on-line reports, CEL have been terminated by the Co-op and have retaliated by taking action against large numbers of motorists with historic tickets. The Co-op have been paying these tickets off on behalf of motorists. It seems unlikely that the Co-op would inform CEL that the £16.25 is due knowing that they would then pay £130 back to CEL. It seems therefore that these claims are on very shaky ground. So shaky, in fact, that CEL never appear to turn up in court to try and justify them. Tomorrow, the 10 September, Civil Enforcement Ltd have no fewer than 5 scheduled hearings, at Bedford, Bromley, Canterbury and two at Nottingham. As CEL are essentially a one-man band it seems unlikely they will turn up at all of them, if indeed they turn up at any of them. The Prankster therefore advises any motorists tomorrow to ask for their full costs if CEL do not turn up. The court can allow this in the case of unreasonable behaviour; pursuing a charge with no merit through the court, then failing to turn up, and having no possible prospect of turning up unless you clone yourself 4 times is certainly capable of being held to be unreasonable by the judge. Take along a schedule of costs showing the time spent preparing for the case, billed at your usual hourly rate, any expenses, travel at 45p a mile and lost wages as a result of the hearing. If CEL do bother to turn up, then as well as the above shenanigans you should point out that as CEL are claiming against the keeper of the vehicle then the Protection of Freedoms Act 2012 sch 4 limits the amount claimable from the keeper to the amount on the parking ticket, which is £100 not £130. You should also point out that as CEL seem to have no idea whether the amount is a contractual charge, breach of contract or trespass, then perhaps they should refrain from issuing claims until they exactly what it is they are claiming for. Expedion are the new debt collectors used by ANPR Ltd.
From their web site it appears that they pre-judge all cases, and regardless of any 'evidence before us' already decide that the motorist's chances are slim. 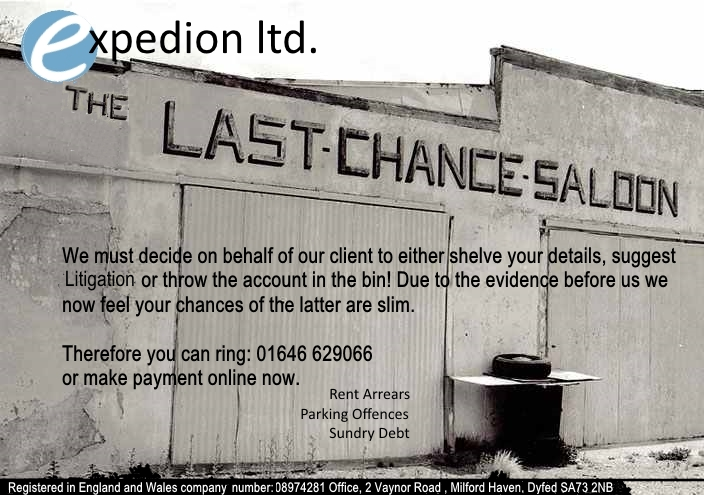 Expedion certainly appear to take on any case, however slim their own chances; The Prankster has previously reported how they are pursuing a motorist over a parking charge issued to a black car when the motorist's car was orange. Expedion is run by director Patrick Crossley who also works for ANPR Ltd. The company secretary is Peter Howarth. Following yesterday's blog post The Prankster has had an interesting email from Mr James de Savary, which he prints below as a right of reply. The Prankster will always allow parking companies the right of reply if they wish to take him up on this - simply email to prankster@parking-prankster.com. In a nutshell, Mr Savary has pointed out, and The Prankster agrees, that the grace period is not a free parking period. It has a specific purpose which is to allow the motorist to park, acquaint themselves with the conditions of parking, and then choose to stay or leave. It is not a five minute free for all where a motorist can nip off to buy something, post a letter, or in general leave the car park to do anything else. A motorist can choose to risk doing this, but then they also run the risk of getting a ticket. The particular car park is used by many extremely short-stay visitors and so would suffer a significant loss of revenue if all motorists who wanted to nip into the shop for a few minutes decided not to pay the 40p charge. The attendant, who is uniformed, is therefore instructed to issue tickets to all motorists who leave without paying, and is also instructed to check all pay machines first and to make a detailed witness statement regarding the event. The Prankster considers this to be reasonable behaviour. Obviously in this particular case the accounts of motorist and attendant differ considerably. The Prankster advises whichever party is 'doing a Huhne' to reconsider and come clean. Mr De Savary's email is reproduced below. Further to your recent blog regarding the Parking Charge Notice issued in ’12 seconds’ that we issued, I just thought I would drop you a note to give you a little back ground to the car park and my involvement in parking. I want to make it clear that I am not against what you do and in fact I believe that ‘online publicity’ such as yours can help to improve the industry. The objective of this email is to introduce myself, give you some information on Jengers Mead and how we operate the car park. You can then draw your own conclusions and of course send me any of your comments should you wish! I am not soft to negative publicity so this is not a pleading email, you will draw your own conclusions. I just want to bring some facts to light about Napier and how I run the organisation. I first became involved in the parking industry after possessing a car park with a property that I owned. That car park was free and I was the unpopular individual who introduced charges! I was not happy with the service that I received from an operator at the time and decided that if we ran the operation ‘in house’ we could have greater control. So Napier was established. Since 2006 we have grown quite substantially and the main focus of my business is to purchase land in order to run a commercial public car parks. Jengers Mead Car Park is a property that we have owned since 2007 (or thereabouts). The car park has about 20 or so ‘on street’ type spaces and a larger car park to the rear of the shops, there are various access roads that we also own. The car park used to be free and then we introduced charges, which as I am sure you are aware is generally not popular. The car park is critical to the village and we have always recognised this and have tried to keep the charges as reasonable as possible. Up to 20 minutes – 40p. Up to 1 hour – 80p. Up to 2 hours - £1.20. And so on up to about £3 a day. I personally feel this is not excessive. There are 3 pay stations prominently placed evenly through the car park. There are signs approximately every 3 spaces in the ‘on street’ type areas. It is a well signed location. We have engaged with the local community partnership and I have also invested in refund vouchers for the shops and made funds available to do a ‘refund scheme’ where shoppers can get deals for example in local shops. The idea to encourage people to pay and to reduce the impact of the charges. Some have been willing to engage but for many the parking is not an issue, despite what you read online. We get quite a bit of negative feedback because a large number of visitors are only visiting for a short period of time. Perhaps only a few minutes, say to buy a sandwich or post a parcel. And we do insist that people pay and display even for these short visits. However a number do not (not many), I think they think, oh I will only be a few minutes they wont catch me or I am not paying if I am going to be less than 5 minutes. My view is that our product is parking and we charge for this. We therefore issue a few tickets to people in relatively quick time. However I want to be perfectly clear that if someone is reading the signs and decides to leave or is in the process of buying a ticket, we will not issue them with a Notice. We will if someone parks and then goes about their business (out of the car park). We do therefore fully comply with the BPA grace period element, and we have had this raised before both with POPLA and the BPA and the BPA have always been satisfied with position when a complaint occasionally arises. The attendant is uniformed and does not ‘hide’ he is not incentivised and to be honest I would love it if everyone paid and displayed and then I could move him elsewhere! However people don’t, they begrudge our charges and risk it. Many returning directly to their car with goods purchased and the excuse, oh I just went for change, getting in their car and driving off. Clearly trying to deprive us of the small parking fee that we are entitled to. Every Notice issued is quality checked and if there was any underhand behaviour we would know about it. I am sure the odd mistake happens but rarely and if we are aware of a mistake the Notice is cancelled. The parking attendant also makes a witness statement for each ticket issued so we know where the driver went, how long they were and any interaction with our attendants. This helps us greatly with appeals. There are some who would say that we should give 5 minutes. However as the majority of users are only making a short visit this would cost us hugely. Before we chose a pay and display system for this location we looked at a barrier solution, however that doesn’t work, there are too many rights of access and adjoining properties, deliveries etc… So not only are their operational constrains there are also legal issues. We have had the likes of Parking Eye attempting to get their hands on it, they would have a field day given the number of people who get away with not paying. However I have opted for a chap on the ground from time to time. A softer approach perhaps. Please I am not keen on the ANPR systems at the moment. In respect of the incident that you reported, I have tried to match it with our records and I believe given the timings that I have. The gentleman was looking to make a quick stop in order to get something for his eyes. I believe the Chemist or relevant shop is just on the ‘High Street’ he was only going to be a couple of minutes as posted on the forum. Our attendant saw the man park walk past the pay station and out of the car park, he was not reading the signs or deciding to stay or go. He went about his business. He then returned directly to his car at 1512hrs got in his car and left at 1513hrs. He was gone a couple of minutes and it is highly probable that he completed his business as he intended. How he has stated it on the forum is not factually correct and he is simply trying to get an angle together in order to escape paying. After all I bet he paid for the eye ointment that he purchased. Before issuing the ticket the attendant checks to ensure there is no voucher or permit displayed he then checks the pay stations, signs etc… to ensure that someone is not purchasing a ticket. In this case there was no ticket displayed and the attendant had observed the driver leave the car park. The 12 second parking period is only detailed on the ticket for the purposes of satisfying the Protection of Freedoms Act. It is as you are aware necessary for all Notice to Drivers to refer to a parking period, the Act does not specify the min or max. So it is just to tick that box in case a Judge scrutinises the relevant section. In reality the driver was probably parked for around 4-5 minutes and made no effort to read signs or pay, he simply left the car park on his own business and we issued him with a ticket correctly. I doubt anyone can agree that he found the 40p charge too much and decided to leave? I have not set the business up to make a quick buck. We have made serious investments in the industry and want to do things the ‘right way’ in many areas we have created a car park where none existed and invested in derelict sites for the benefit of local areas. We park many thousands of cars and have lots of happy customers who find our facilities well run and good value. I am not out to have our operatives issue loads of Parking Charge Notices, if I was I would install ANPR and cameras at all our sites and have a healthy income from that. However we will issue them and enforce them if necessary. I do find it discourteous when people park on our land, land that in some cases we have invested millions in and think they can get away without paying. Motorists should take a moment when parking to just look around and make sure they park correctly, especially if they are new to an area. 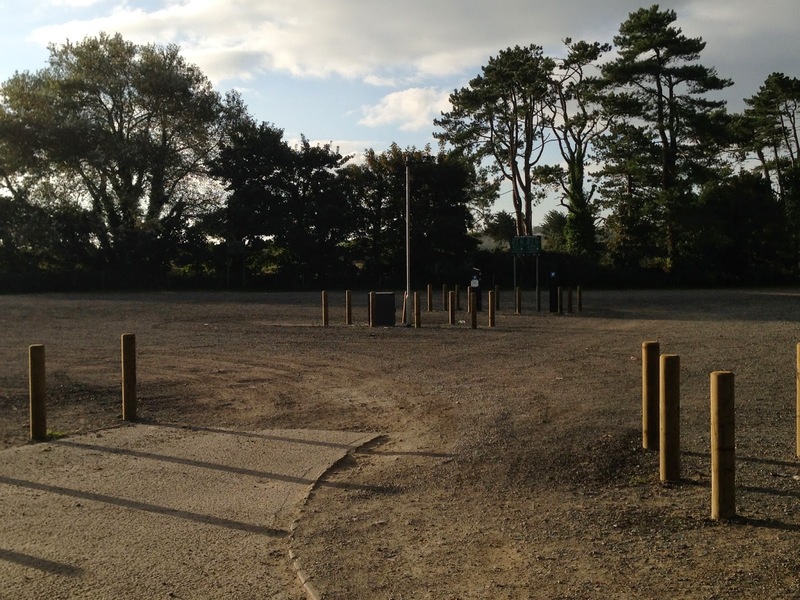 For your info we have had 36 POPLA appeals decided to date for Jengers Mead Car Park. Of those 33 were rejected (in our favour) and 3 were accepted. So we must be getting something right…? I hope you have found this email of some interest and am always happy to engage on the topic of parking.